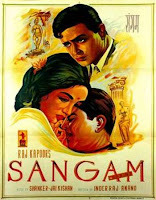 Sangam 1964 Hindi | FunToMovies 300 Movies '+g+"
Story line: Sunder Khanna is an orphan and lives a poor lifestyle in India. He is friendly with wealthy Gopal Verma, the only child of Judge Verma; and a wealthy girl named Radha, who is the daughter of an army Captain. The trio grow up, and Sunder falls head-over-heels in love with Radha, but she as well as her parents reject him. Sunder decides to prove himself to be worthy of them and enrolls in the Indian Air Force, carries out a risky flight to help army soldiers, disappears, is believed to be dead, but re-surfaces virtually unscathed, and returns to get married to Radha. After the marriage the couple go for a honeymoon in Rome, Paris, London, and Switzerland. Sunder also invites Gopal, who is now a Magistrate. One day before going to attend a party, Sunder finds his life turned upside down when he comes a love letter written to Radha by an unknown male. Torn with suspicion and hatred he grabs his revolver and confronts Radha in order to find out the author of this letter and kill him.